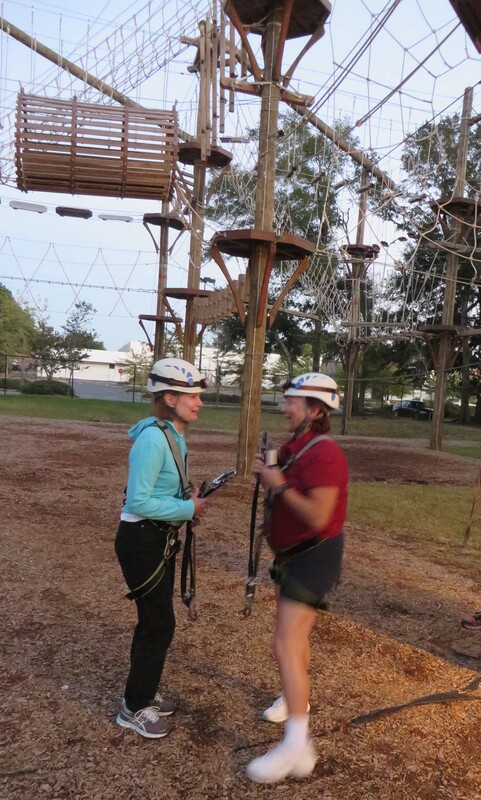 A trip to an aerial adventure park is something everyone should try! As you perform each of the above-ground challenges, your emotions range from slightly scared to euphoric. It’s an exhilarating experience to put your body to the test and find that you can do more than you think you can! 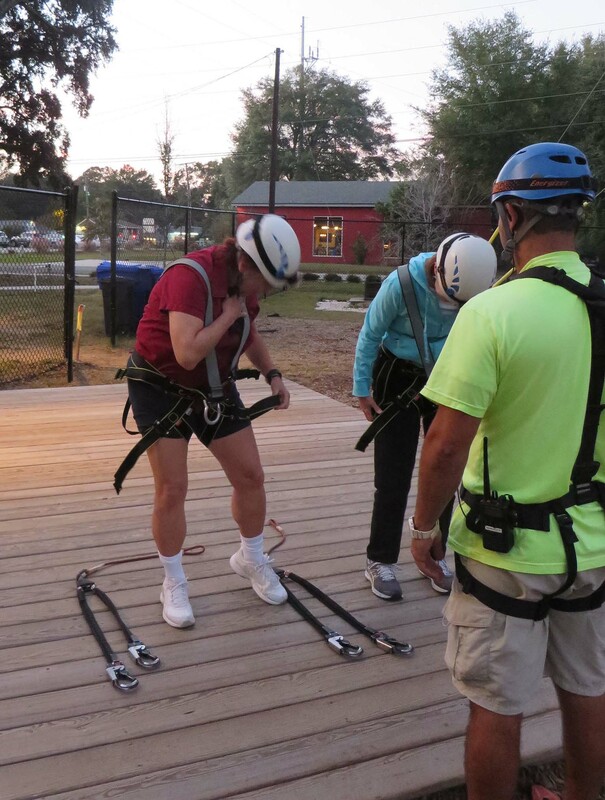 The adventure park my friend Cheryl and I went to — Wild Blue Ropes in Charleston, SC — has 75 different challenges. The octagonal supports in the photo above are the stations between them. 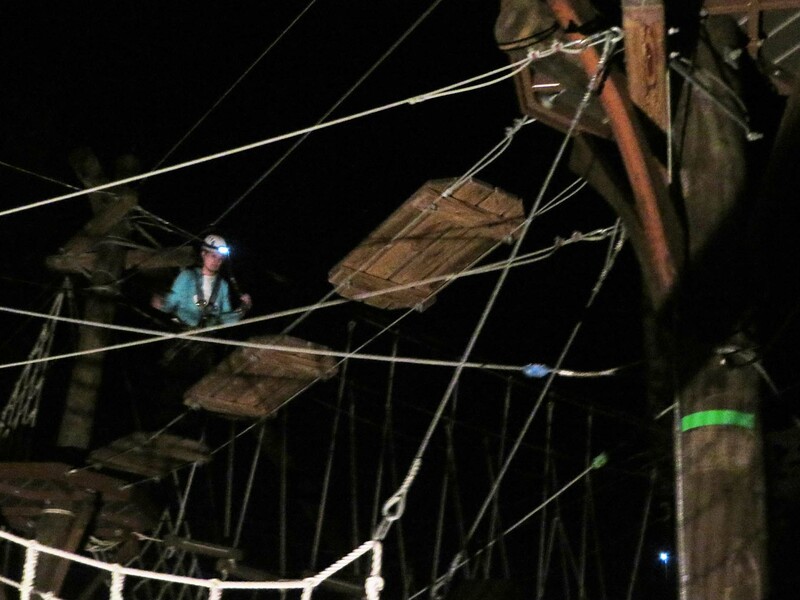 Sets of challenges come in three levels of difficulty — the green course (easiest and lowest – at about 15 feet above ground), blue course (harder and a little higher) and the black course (toughest — and highest — at about 35 feet above the ground). Before we got there one night after work, we’d only glanced at the website, and didn’t quite know what to expect. (That was probably good.) We just thought it’d be fun. We’d both done ziplining before and were fine with that, and we’re both avid exercisers — so we were hoping those experiences would help. 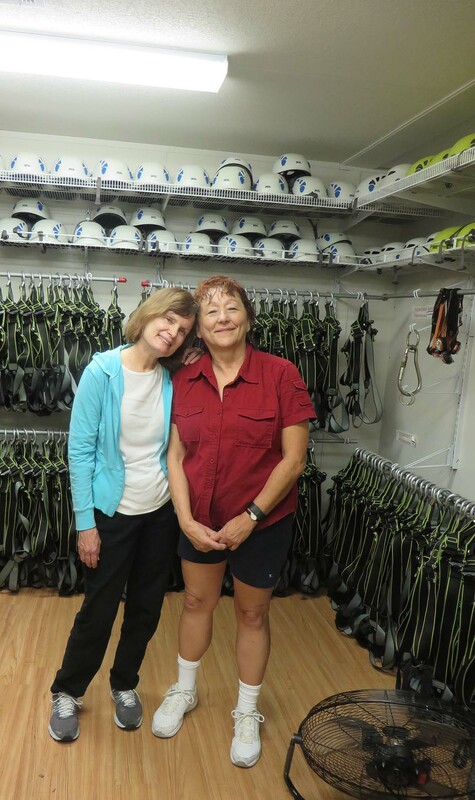 When we arrived, Marcus — our “ropes guide” helped us suit up in safety gear — including hard hats with a miner’s lamp on the front that glowed (since it would be dark before we finished). He explained how the double-belay cable system that attaches you to a line overhead at all times allows only one side of the cable to be unhooked at a time. And that while you’re climbing, you unhook yourself from the line above you after finishing one challenge and hook yourself to the line above the next challenge, while standing on an octagonal support. We walked up a set of wooden steps and started the lowest-level challenges, which were about 15 feet above ground. Everyone’s seen a movie with a wobbly bridge with rope railings that crosses high above a stream far below, right? Think of Indiana Jones. At an aerial adventure park, you get to cross all kinds of them! The “bridges” consist of wooden steps, ropes, poles, beams and other devices. And they don’t always have rope railings on the sides! Cheryl let me go first (since it was my big idea) and we slowly made our way — one at a time — across straight wooden steps (like a bridge), crooked wooden steps (like a house of horrors — yikes), ropes, pipes, poles, a tunnel and more. We didn’t always walk forward all the time, either; many of the paths required you to walk sideways. One challenge consisted of two ten-foot beams about 3 inches wide that were separated from each other in the middle by about 15 inches. We had to walk across the first beam (holding ropes at shoulder level) and step into space over and onto the second beam, then walk across it to the next wooden support. Felt like one of the Flying Wallendas (with quivering legs) on that one! Speaking of quivering… All the suspended walkways move — and they can get VERY shaky in the center! Even if you don’t have great upper-body strength, you find that you can clutch support ropes more tightly — and for longer — than you ever thought! 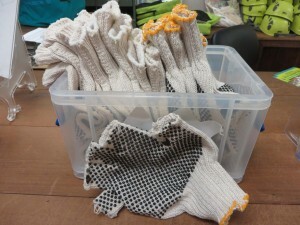 And we learned that holding the ropes at shoulder level — rather than waist level — reduces the shaking below (somewhat). By the time we’d been climbing 15 minutes or so, it was dark. The good part about that was we couldn’t really see exactly how far we were from the ground! The height didn’t bother me, though, because I felt safe with the double belay system — but one of the shakiest walkways almost stopped me cold and really got my heart beating. When we finished the green course and about half of the blue course, we took the quick route to the ground by sitting on a wooden platform, grasping a rope and flinging ourselves into space. The rope system is designed to create a slow descent (which Marcus demonstrated for us before we did it). Nevertheless, it took a monumental leap of faith to jump off that platform! After shedding the gear and posing for some “after” photos — we agreed that the aerial adventure park was one of the most fun of the many adventures we’ve had together. If you get a chance to go to one, give it a try. 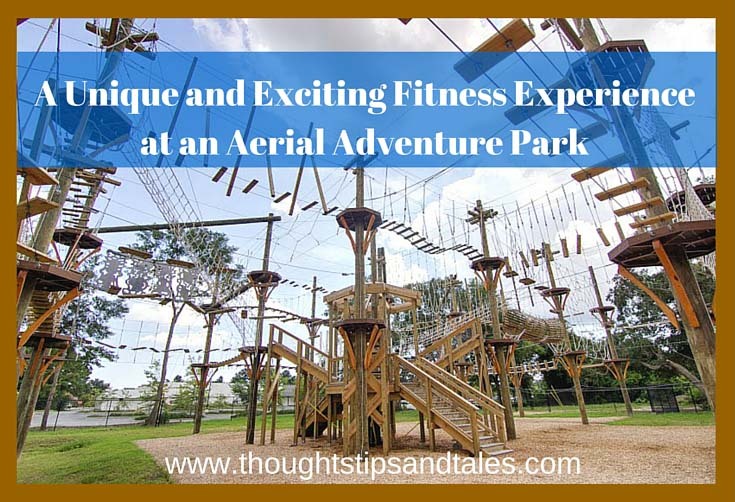 This entry was posted in aerial adventure park, fitness and tagged aerial adventure park, aerial park, fitness, ropes course, Wild Blue Ropes. Bookmark the permalink. That looks like so much fun! and very scary, too!